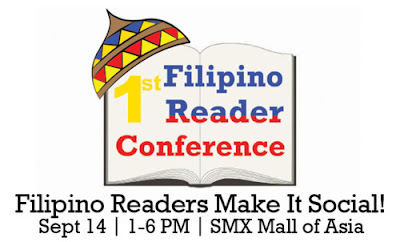 So I'm pretty much excited about the very first Filipino Reader Conference this coming September 14, 2011, to coincide with the annual Manila International Book Fair (MIBF) at the SMX, Mall of Asia running from September 14 through 18. Several Filipino book bloggers (some of whom I've yet to be acquainted with) have organized this event, and to date, pledges from sponsors have been pouring in by way of support to this neophyte affair. Expected attendees are bookworms, book club members, book bloggers, writers and publishers, as well. Personally, I've been thinking about how I can pledge my own support for the event, but since my time is not my own these days (I have an 8-month old darling girl to take care of, as I'm a hands-on Nanay), I've resolved to spread the word instead and hope to be physically present come the day of the event. We’re borrowing Filipino Fridays from the Filipino Book Bloggers and turning it into a weekly meme in the weeks leading up to the ReaderCon. 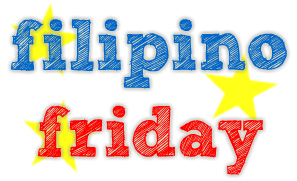 Every Friday, a topic will be posted and all Filipino readers are encouraged to make their own post about that topic. Anyone can join as long as your post can be viewed by everyone else - you can post it on Tumblr, Blogspot, Wordpress or any other social networking site - just make it a public post. A widget will be included in each Filipino Friday post to round up all the links so we can all browse and comment on all the meme posts. Introduction. Tell us everything that we need to know about you as a Filipino reader. You can talk about the genres that you read, your favorite authors, your comfort reads and your best books of 2011. You can also include links of where other readers can find you online: blog, Twitter, Goodreads, Shelfari, etc. Hmm. Let's see. Here are my answers. I read, for the most part, general fiction. I love John Grisham, Anne Rice, Carlos Ruiz Zafon, Yann Martel, among others. The very first book that I fell in love with, The Wizard of Oz, is a children's book, which I've read when I was all but a budding reader, but over time, as I've begun to add more years to my age, my taste in books has likewise matured: I gravitated towards legal thrillers and mysteries. I also read books that my reader friends recommend, no matter the genre, and I check out the New York Times Bestselling List and other bestsellers lists for titles that would catch my fancy. So that's not to say that I have foreclosed the idea of reading books from other genres. Once in a while I pick up some fantasy, YA, or children's books. If you will see my read shelf on Goodreads, you will see that my taste in books is diverse. I guess it would be safe to say, then, that I read practically everything. My best reads (it's so hard to choose just one!) for 2011, so far, belong to different genres (which proves my diverse choices in reading). They are The Help by Kathryn Stockett, Never Let Me Go by Kazuo Ishiguro, A Discovery of Witches by Deborah Harkness, and Fragile Things by Neil Gaiman. The first two are general fiction reads, the third is more into occult/paranormal, and the last one, I guess I would categorize more under fantasy. I'm currently reading A Game of Thrones by George R.R. Martin, a fantasy book (although my husband, who loves it so much, says the book isn't really fantasy, per se), and am loving it so far. Where can you find me? Well, there's my personal blog, as I mentioned above, Twitter and Goodreads. I also have a Facebook account, but it's set to private so I guess that's not as accessible as all the other sites that I patronize. I'm not planning to read George R.R. Martin's books because I've heard that he's fond of killing off characters. I might just end up really frustrated because I tend to get invested in the characters. :P I'm really interested in the HBO series though. I have mixed feelings toward The Song of Ice and Fire series. One of my selves (the nosy one) tells me to join the bandwagon, while another one of my selves (the antagonist), tells me otherwise. So I went with the antagonist. I'll just pick up The Rabbit Series by Updike and The Alexandria Quartet by Durrell. And the nosy one is gloating because I have a gut feeling that I'll be reading those alone, hahaha. Hello, Atty. Monique! Thanks for visiting my blog, by the way. So, another eclectic reader, eh? Yay for us! I read Never Let Me Go this year, too, and it was one of my best reads so far, though not really the best. Oh, and I'm stuck on Martin, too. Currently reading his fourth book, and I admire how he can get me to like previously unlikable characters. Hope to finally meet you at the ReaderCon! HONEY: Please call me Monique, nakakahiya naman. :) Yes, I prefer the variety in my readings. I don't think I'll ever stick to just one genre. There'll always be favorites, but the diversity is still the way to go for me. Hoping to meet you at the Reader Con, too! :) Thanks for the comment on my blog! So nice to catch a kindred spirit online! :) I've always meant to read The Help but I've somehow kept on putting it off; I do have a feeling that it will be amazing. I have a copy of A Discovery of Witches but I haven't gotten far. I'll be sure to get back to it after this.